Cell to cell: When HIV infects a cell, it programs the cell to express the viral protein Env, which the virus uses to spread to neighboring cells. 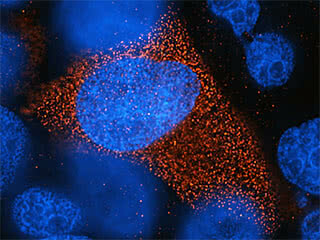 Above, Env (red) produced by one infected cell has recruited other, uninfected cells, causing them to fuse, and their nuclei (blue) to cluster. Viruses attack cells and commandeer their machinery in a complex and carefully orchestrated invasion. Scientists have long probed this process for insights into biology and disease, but essential details still remain out of reach. The study focused on two viral proteins known to bring about HIV’s infection of human white blood cells. The first one, called envelope or Env, sits on the surface of the virus and, by binding to receptors on the host cell, helps the membrane that encapsulates the virus fuse with the cell’s outer membrane. A second protein, Vif, destroys an enzyme that host cells produce to defend themselves against the virus. In an effort to better understand how these two proteins function, the team wanted to map their interactome—meaning all the proteins with which they associate within a host cell. To accomplish this, the researchers needed to devise a way to isolate clusters of interacting proteins from cells during different stages of infection. Such experiments can be done by introducing a genetic sequence into the viral genome—a “tag” that acts like a piece of molecular Velcro, allowing one viral protein to be yanked out along with all the other proteins associated with it. Molecular arms race: The HIV Vif protein coordinates the destruction of a host cell’s defenses. Above, 22 hours after the start of an infection, speckles of Vif (red) are visible in the cytoplasm of an infected cell. It sounds simple, but making it work took a decade. “We developed a technique to find places in the HIV genome where we can insert stable tags without affecting the virus’s capacity to proliferate. In effect, this allowed us to expand cultures of the infected cells along with the tagged viral protein,” he adds. Next, the researchers infected human cells with viruses carrying the tagged protein sequences, and were able to pull out and identify a large number of host proteins directly during the infectious process. This provided the first evidence that many previously underappreciated host proteins interact with the viral machinery during replication. One important discovery has already emerged from the lists of proteins. Viruses, including HIV, often attack as so-called virions, which are individual packets of protein and genetic code. But they can also pass directly from an infected to an uninfected cell, a more effective mode of transmission. To do so, the virus appears to use host proteins to construct a platform, a close junctional surface, between cells. From the list of proteins that interact with Env, the researchers have identified cellular proteins predicted to contribute to this platform between cells. Because this route of transmission protects the virus in a sequestered environment, away from host defenses, the new findings may aid in the development of future anti-HIV therapies. According to co-author Brian Chait, Camille and Henry Dreyfus Professor and head of the Laboratory of Mass Spectrometry and Gaseous Ion Chemistry, the new approach offers a rare glimpse into the process by which HIV invades and resurrects itself within a cell. This work was supported by the National Institutes of Health (grants: R01AI047054, R21AI065321, R01AI081615 and R21AI097233, P41GM103314, U54GM103511, P41GM109824, R01AI093278, R33AI084714, DP1DA026192, and R21AI102187).